The trouble with Nigel Farage’s threat to ‘don the khaki and pick up a rifle’, a threat you might have last heard at the Golf Club Christmas dinner when Uncle Jimmy had too many sherries, is that we’ve actually seen Nigel in ‘front-line’ action already. He ran away. Bella readers might recall his visit to the capital a few years back to try and spread his fash-lite message got short-shrift, and he turned out to be more Blowhard than Diehard, more Clint Hill than Clint Eastwood. 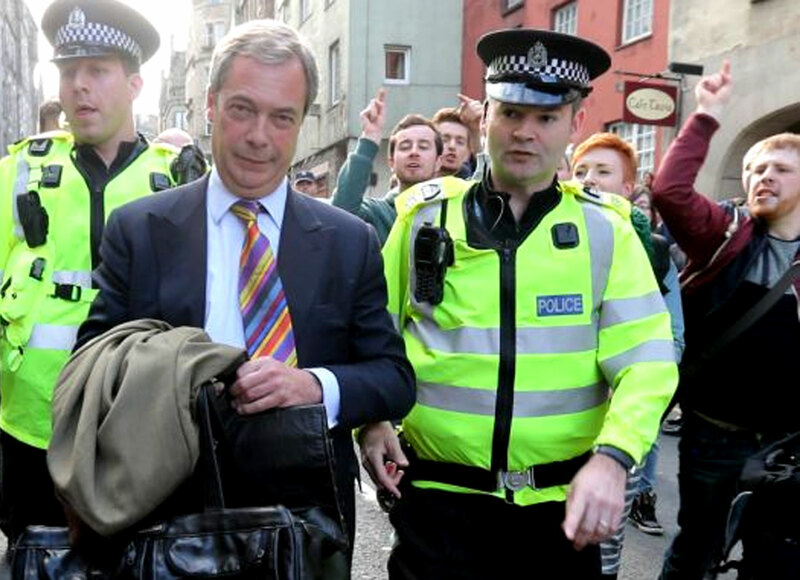 It was way back in May 2013 when Farage came north in an attempt to re-launch UKIP in Scotland with a charm offensive orchestrated from the Canon’s Gait pub in the High Street. He was first forced out of the boozer onto the Royal Mile after demonstrators disrupted his press conference with catchy-shouts of “racist”, “scum” and “homophobe” and told him that his extreme anti-immigrant politics were not welcome in Scotland. “We’ve never had this response anywhere else before” he said as he was bundled away to safety. I’m not sure the front line’s the place for Nigel. Not a pretty sight and an example of the anti-liberal authoritarian left at its worst. These fascists never pick up rifles themselves,they get others,who are stupid enough,to do that sort of thing.